Having grown up in the U.S., the Amason was a Volvo model that passed me by, but in Scandinavia, it was a popular car in the 1960s. Named after the fierce female warriors of Greek mythology, Volvo adopted a Swedish spelling for its design, and the band has followed suit. Perhaps the spirit of a female warrior coupled with the liberatingly swinging ‘60s is a suitable description of this five-piece band of Swedish-born and based touring musicians. Or perhaps their name, chosen spontaneously by Pontus Winnberg of Miike Snow, is just one aspect of this multi-talented, musically minded group of friends that first came together in 2012. The security and strength offered in Amanda Bergman’s vocals is reminiscent of a warrior, but the whole picture of Amason carries much more depth than a single simplicity can encompass. The story of Amason begins with brothers Pontus and Petter Winnberg, whose father was a music teacher and classical musician. When Petter was 16, he studied at a jazz music school, where he met Nils Törnqvist, and from then on the two have played together in a multitude of musical constellations, including Little Majorette. In 2008, Nils saw Amanda playing a gig in Gothenburg with her band Hajen, and was so blown away by the power of her performance that he just had to tell Petter and Pontus about her. Pontus contacted Amanda through Myspace, and the two recorded a few tracks together. A few years later, Pontus met Gustav Ejstes of Dungen through Stockholm-based music collective INGRID. Within this open setting, they started speaking about making music together. When Pontus played Gustav a tape of him and Amanda, who currently writes under the name Idiot Wind, as she howled along to a drunken piano, Gustav also was blown away by Amanda’s voice, her way of expressing herself, and began thinking, “Let’s make something together.” Which is precisely what Pontus posed once the tape had finished. At the tail end of 2012, these five finally arrived in a musical space together. Having arrived in a collective sonic space, they all hopped aboard a vehicle, with their past paths and divergent musical tastes thrown into the mix, and found this was more than enough to fuel Amason forwards. A sound created out of collaboration, with each member inhabiting an equally important space. Be it Nils on drums, Gustav on organ, guitar, and vocals, Pontus on piano and pedals, Petter on bass and vocals, or Amanda on synth and vocals, these simpatico souls share the creative ground as Scandinavians share their land. Everything is everyone’s. And the music is all the greater for it. When Pontus first booked time in the studio and miraculously managed to get all five of them there during that time, the rest clicked into place. They started out by putting an idea on the drawing board, thrashing it out on their instruments, recording the tracks, writing a melody and lyrics, and swiftly had some finished songs to present. 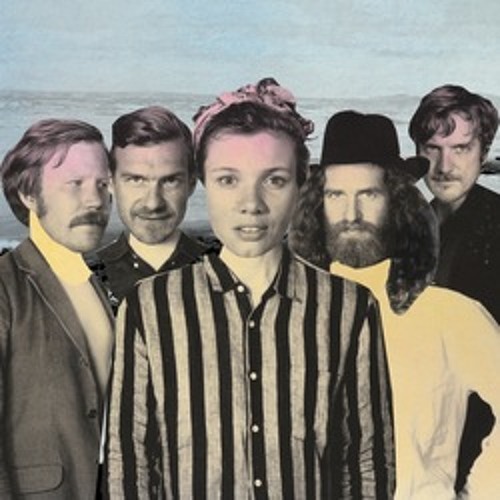 The first song to hit the Swedish airwaves, “Margins,” was soon followed by a self-entitled EP released in August 2013 on Stockholm-based INGRID, complete with single ”Went to War.” In February 2014, Amason released “Ålen” (The Eel), and on October 28th, 2014 they will release their single “Duvan” (The Dove) worldwide on Fairfax Recordings and INGRID. Their debut album, Sky City, is due for worldwide release in early 2015. With lyrics in both their native Swedish and the Swedish musical language of choice, English, Amason create in the moment, record almost instantaneously, and soon after scan the horizons for a stage, where the music truly comes alive, where they can share their collected collective moments. They fill their together time with sound, with music-making, with production and lyric-crafting and the joy of the song. Not to say that they don’t have to work to create what they get. Bringing five busy people together and getting crafted songs down in a state of permanence is a mammoth undertaking in and of itself. But as the old adage goes, where there is a will, there is a way. And the Amason will, the Amason way, is celebrated and magnified and revolves around the power of music. While the classic Volvo Amason still motors onwards in its intention to take people places, so too will a pure love of music drive Amason the band far into the future.